If you want to learn how to play blackjack online, you need to know how to win. If you know what you’re doing, you can take the house for a ride. It sounds obvious, but the first thing you need to do is make sure you understand each moving part of the game. 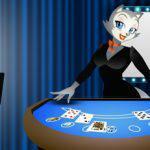 Play blackjack at CoolCat Online Casino and win big today! Here’s how it works: you are dealt two cards, face-up. The dealer is given one card face-up, and one card face-down. The goal of the game is to have your cards add up to more than the dealer’s, without going over 21. Jacks, queens and kings all count as 10, aces count as your choice of one or 11. After you get your cards, you can choose to “Hit:” take another card; or “Stand:” stay with the cards you have. If you are dealt an ace and a ten or other face card, that’s blackjack; the only way you won’t win is if the dealer has blackjack as well. The dealer is constrained in the way they must play their hand: if the dealer is showing 16 or under, they have to Hit. If they are showing 17 or more, they have to Stand. Let’s try another sample hand. You get dealt a 10 and a 7. Now 17 isn’t as high as 21, but in most cases you would still want to Stand. The deck has more cards worth 10 than any other, so chances are you’ll “Bust:” go over 21. Then the dealer wins. Those are the basics on how to play blackjack. Before getting into more of the particulars of the game, I recommend playing a few practice hands to let these beginning steps sink in. Try out blackjack for free! It’s all well and good to know the basics, but there’s so much more to how blackjack works, and you’re going to need to understand each tool in the player’s toolbox if you’re going to learn how to play blackjack and win, online or in person. InsuranceIf the dealer is showing an ace as their face-up card, you have the option to get insurance. It’s a side-bet: if the dealer’s face-down card is a ten or face card (blackjack), you get 2:1 odds on your bet. With insurance, you protect yourself from a potential bigger loss from the dealer’s blackjack. The disadvantage is that if the dealer does not have blackjack, you’ve just wasted a bet. Your insurance bet can’t be for more than half the value of your original bet. Double down blackjackIf you think you can make 21 on your next card, it may be time to Double Down. You double your original bet, and are allowed one final card. Knowing when to effectively Double Down is one of the best ways to win at blackjack. Again, most of the cards in the deck have a value of ten, so the best time to Double Down is when the two cards you are dealt equal 11. Learning how to win at blackjack is all about taking advantage of the odds: if you have an 11, you have a much better chance of hitting 21, and yet you have the chance to bet the same you did before you had anything, doubling the bet now that you know the odds are in your favor.Be careful when Doubling Down. You only get one card, so don’t double down if your hand is too low. It’s also important to keep an eye on the dealer’s card; whenever you’re considering putting more money on the table, you want to have a good idea of the risk factor of your situation. If the dealer is showing an ace, it may not be the best time to double your bet, even if you’re showing 11. Blackjack SplitThis is another tactic that many new players fail to use (or fail to use effectively). If you’re dealt two of the same card, you may choose to Split: your cards are split into two hands, which each receive a new card. It also doubles your bet, since you now have the same bet on the new hand as well. Knowing how and when to Split is an invaluable thing to understand.Say you are dealt two tens. You could split those, and have two hands that could turn out great, right? Wrong! The first thing to remember about splitting is that you should never Split a winning hand. 20 is a great hand, and there’s a good chance that splitting it will lead to two bad hands, and cost you twice the cash.The best time to Split is when you’re dealt two aces, or when you’re dealt two eights. Two aces is a no-brainer – the likeliest card to pull from the deck has a value of ten, so by splitting your aces, you’re looking at two potential blackjacks, baby!Eights make a lot of sense to Split when you take a look at it: two eights have a value of 16, which is a terrible blackjack hand (too high to safely Hit, too low to safely Stand). On the other hand, two potential hands of 18 is pretty great. And since you have a good chance of turning at least one of those eights into an 18, it’s better to go for it rather than take your chances with the 16. There’s a lot to be said about how to play blackjack Splits. A whole guide could be devoted just to this one maneuver by going through all the potential dealer hands and situations. Of course, the best way to really understand the possibilities is to play a few rounds of blackjack. You can try it for free here with virtual cash, or if you feel you’re ready, you can create a free account to claim a $25 Free Chip play blackjack with real money at stake. We recommend reading this guide through to the end before using your Free Chip. Sometimes it’s easy. If you have an 11, of course you’re going to Hit (unless you’re Doubling Down instead). If you have a card lower than 11, it’s also an easy choice: you can’t Bust, so you should Hit. Once your hand totals more than 11… that’s when you have to play smart. One more thing I want to go over before we go deeper into this: having a soft hand vs a hard hand. For example, if you have an ace and a six, that’s a soft 17, because your ace can make the hand count as seven or 17. If you have a 10 and a seven, that’s a hard 17, because it can only be 17. 5) If you have a hard 13, 14, or 15 and the Dealer has a two, three, four, five, or six. It’s a lot to remember at first, but memorizing these rules is a good idea if you’re going to be playing a lot of blackjack online. Having this basic, concrete strategy under your belt is how to win at blackjack. We’ve all been there: you lose a few bets and start thinking irrationally. There’s a temptation to raise your bet to win back what you’ve lost, and having a cloud of frustration over you isn’t ideal for remembering strategy anyway. If you find yourself on a losing streak, rather than allowing yourself to slip into a bad state of play, take a break. If you’re still itching to play, hones your skills on a free version of blackjack, until you’re more relaxed and ready to take on the house for real. If you’re playing online, one of the best ways how to win at blackjack is to start with a higher bankroll. Because the odds are so close on a game like blackjack, if you can find a bonus that has no playthrough (amount you have to wager before withdrawing) and no maximum cashout (a cap on how much you can win), then you can actually push the odds into your own favor. 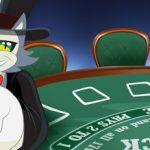 If you’re ready to play, here’s a bonus you can use for blackjack. Even for those who don’t want to put any real money into it, you can still get the thrill of playing with real stakes with a $25 Free Chip, with no deposit needed. 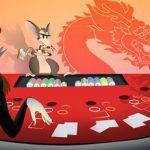 Blackjack is one of the best games a player can learn. If you are able to master all the different elements of the game, you will cut the house edge down to nearly nothing. 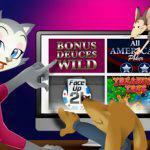 And if you take advantage of casino bonus offers when they come up, you can really start building that bankroll. Make sure you’ve practiced the game before spending real money on it, and apply the different levels of strategy as you progress as a player. 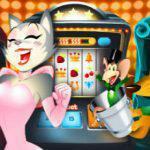 Try and play for fun at CoolCat Online Casino now!